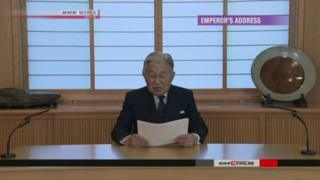 Japan's Emperor Akihito has made a televised address to the nation, to say his declining health means it is difficult to continue in his role. While he stopped short of saying he wanted to abdicate, he suggested it might be wise to hand over his responsibilities at some point. Under current laws there is no provision for him to abdicate, but PM Shinzo Abe has said the government will "seriously" look into that. Here is the official translation of the speech. A major milestone year marking the 70th anniversary of the end of World War Two has passed, and in two years we will be welcoming the 30th year of Heisei (the era beginning when the previous emperor died). At the same time, in a nation and in a world which are constantly changing, I have continued to think to this day about how the Japanese Imperial Family can put its traditions to good use in the present age and be an active and inherent part of society, responding to the expectations of the people. I ascended to the throne approximately 28 years ago, and during these years, I have spent my days together with the people of Japan, sharing much of the joys as well as the sorrows that have happened in our country. I have considered that the first and foremost duty of the Emperor is to pray for peace and happiness of all the people. At the same time, I also believe that in some cases it is essential to stand by the people, listen to their voices, and be close to them in their thoughts. In order to carry out the duties of the Emperor as the symbol of the State and as a symbol of the unity of the people, the Emperor needs to seek from the people their understanding on the role of the symbol of the State. I think that likewise, there is need for the Emperor to have a deep awareness of his own role as the Emperor, deep understanding of the people, and willingness to nurture within himself the awareness of being with the people. In this regard, I have felt that my travels to various places throughout Japan, in particular, to remote places and islands, are important acts of the Emperor as the symbol of the State and I have carried them out in that spirit. In my travels throughout the country, which I have made together with the Empress, including the time when I was Crown Prince, I was made aware that wherever I went there were thousands of citizens who love their local community and with quiet dedication continue to support their community. With this awareness I was able to carry out the most important duties of the Emperor, to always think of the people and pray for the people, with deep respect and love for the people. That, I feel, has been a great blessing. In coping with the aging of the Emperor, I think it is not possible to continue reducing perpetually the Emperor's acts in matters of state and his duties as the symbol of the State. A Regency may be established to act in the place of the Emperor when the Emperor cannot fulfil his duties for reasons such as he is not yet of age or he is seriously ill. Even in such cases, however, it does not change the fact that the Emperor continues to be the Emperor till the end of his life, even though he is unable to fully carry out his duties as the Emperor. When the Emperor has ill health and his condition becomes serious, I am concerned that, as we have seen in the past, society comes to a standstill and people's lives are impacted in various ways. The practice in the Imperial Family has been that the death of the Emperor called for events of heavy mourning, continuing every day for two months, followed by funeral events which continue for one year. These various events occur simultaneously with events related to the new era, placing a very heavy strain on those involved in the events, in particular, the family left behind. It occurs to me from time to time to wonder whether it is possible to prevent such a situation. As I said in the beginning, under the Constitution, the Emperor does not have powers related to government. Even under such circumstances, it is my hope that by thoroughly reflecting on our country's long history of emperors, the Imperial Family can continue to be with the people at all times and can work together with the people to build the future of our country, and that the duties of the Emperor as the symbol of the State can continue steadily without a break. With this earnest wish, I have decided to make my thoughts known.